OK. Well, I’m still working on it. There were a few days I had to bash my head against the wall and do some screaming. It happens. So I changed yarn. Right in the middle of a miter. 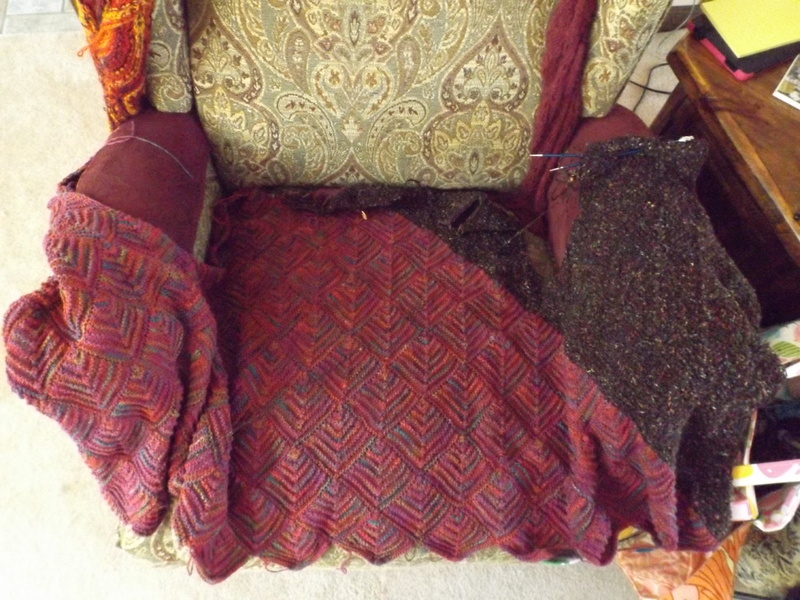 I just cut it off and started using some bumpy brown old Noro. I also changed the miter itself. Now it’s all garter and only 27 stitches at the base. I had to do that to fit it in the same space. And what do you know? I finished the miters in no time at all. Well, that ‘s the way it felt. I need to sew the shoulders and edge. I hope I left enough yarn ends to do it so I won’t have as much to weave in. I haven’t decided on the edging yet, but I’ve got three in mind. Yeah. I know. Crappy picture. This entry was posted on September 20, 2014 at 6:59 pm and is filed under Knitting. You can follow any responses to this entry through the RSS 2.0 feed. Both comments and pings are currently closed.